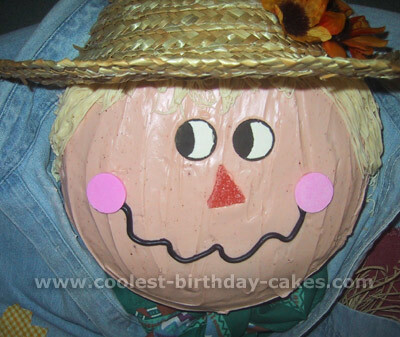 This is a free cake decorating idea for a scarecrow cake. 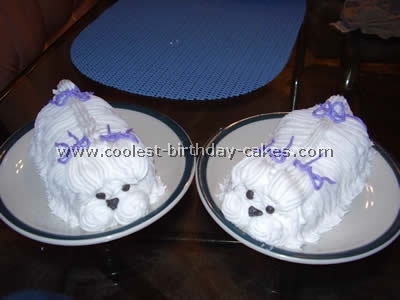 I took two 8" round cake pans, white cake mix and vanilla icing. Then I rolled out white fondant and hand cut the pieces of the scarecrow with an exacto knife and cookie cut the leaves. Fondant rolled into an oblong ball made the pumpkins which are held on by tooth picks. Then I hand painted everything with food coloring gel. 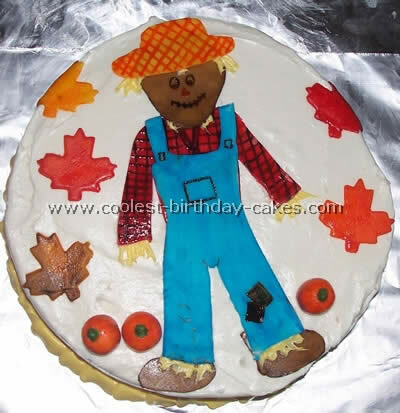 I added yellow icing to look like hay coming out from the ends of the scarecrow. It was fun and I have gotten lots of compliments on it but it takes a few hours. This scarecrow free cake decorating idea was invented for a Harvest Hoe Down at my son’s school. I baked a regular yellow cake mix in a medium size glass bowl to get a more rounded head. To ice the face, we tinted white icing with just a touch of brown icing concentrate (available at craft stores). For the hair, we tinted white frosting with a little yellow icing concentrate and then piped it through a tip especially designed for hair and grass likeness. The eyes and cheeks are Nekko wafers. For the eyes, we used edible food markers (on Nekko wafers) to draw on the pupils and outline the eyes. The nose is a sugarcoated orange segment cut into the shape of a triangle. Candy corn would also work. 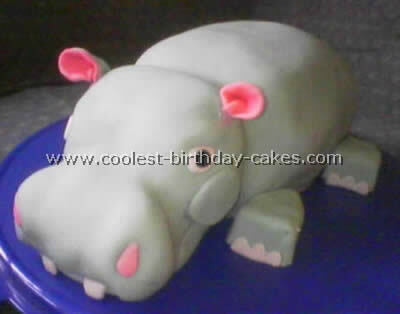 The smile is just black icing piped with a small tip. 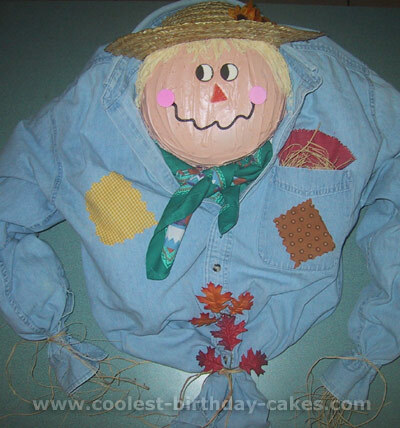 We cut a straw hat in half to put on top of the cake head, added flowers, and even placed a denim shirt around the cake to look like a scarecrow! We filled the cuff and waist area with raffia and left some sticking out for decoration, and tied the cuffs and waist with more raffia. Add a bandana around the neck and you’re done!